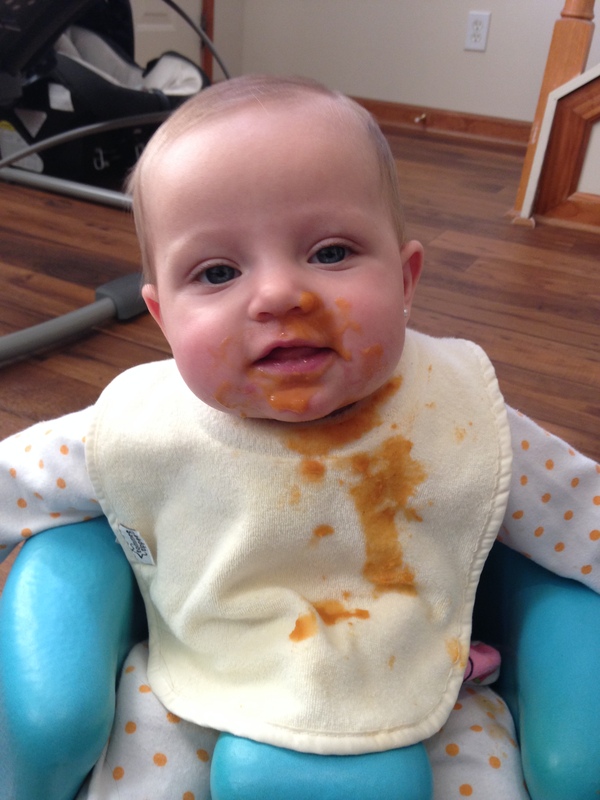 Last week we started giving Eleanor baby food. 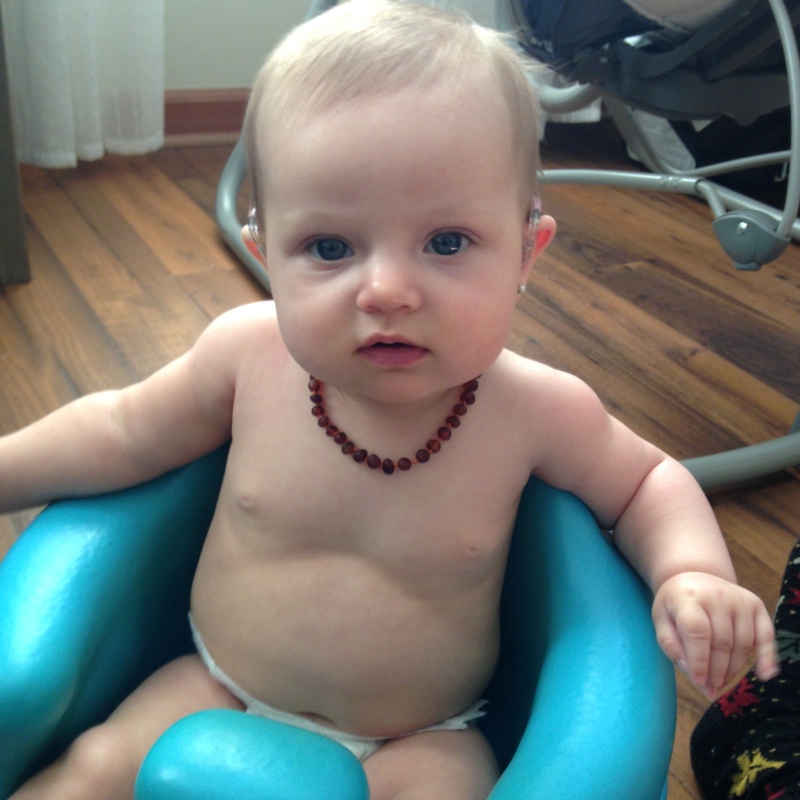 I was surprised to find it emotionally difficult, giving my child sustenance that was not from my own body. It was not difficult for Nora, however. She loved every tiny delicious morsel of big girl food; after the first goopy bite of green beans, she began to ravenously clap her jaws together and her little head dove towards the spoon every time she took a swallow. She hardly stopped to breathe. We laughed as she got food everywhere in an attempt to get it inside of her mouth as quickly as possible. The funniest part is that she’ll eat anything apparently (this must be a genetic trait). So far, we have fed her green beans, carrots, sweet potatoes, apples, and bananas and she has gone NUTS over every single one of them. It made me feel a trifle guilty, honestly. I thought to myself, Should we have tried this sooner? It seems like she’s starving! It was crystal clear after that first feeding session that she had been more than ready to digest something heavier than breast milk. It’s so easy to just live life forever coasting on spiritual “milk.” Going to church and reading five-minute devotionals every morning doesn’t cut it. (But boy, does a five-minute devotional sound appealing to a busy mom…especially when it just talks about the light and fluffy side of Christianity so you don’t have to actually think deep thoughts about the nature and character of God.) The problem with this kind of “milk” is that eventually you become weak and stop growing. Oh, I wish that I would hunger for righteousness the same way Nora hungers for her carrots; with an admirable focus and eager expectation that cannot be thwarted, no matter the distractions in her environment. Like her, I wish that I would stare at that spoon with delightful anticipation before zealously consuming every last drop of wisdom and truth and promise. But I don’t. I stare at the pages sometimes without eating. I push away the heavy spirituality and instead consume what goes down easy. Why do I think I have enough energy to work alongside my husband in ministry without first filling up on the Bread of Life? My prayer today is that I would feed on the Scripture every day in such a way that its heaviness gives nourishment to my oftentimes fragile faith, so that it may grow. My season of life makes this so difficult, but I am grateful to be surrounded by faithful women who truly hunger for the things of God. Surround yourself with hungry people. I also notice that Nora has trouble keeping the food in her mouth because of that “tongue-thrust reflex,” so I have to use the rubbery spoon to scoop up the food that falls out of her mouth and then I offer it up to her again. When there are Scriptures that I spit back out because they are hard to swallow, God gently shoves them back inside my mouth and says, “I don’t want you to miss out on a single bit of this. It’s good for you.” What a good Father. I hope He delights in feeding me His Truth as much as I get a kick out of watching Nora eat. Shes’ a hoot.